Now here's a nice tag that's for a worthy cause. And it's very timely too, what with Easter only a few days away. Thanks Hazel of Delineating Des for tagging. Thanks to Marce Chris of Chris Chronicles too. 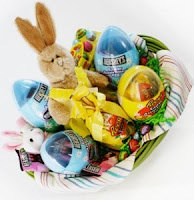 The basket full of Easter goodies is just perfect! And just so you'll know, passing this virtual basket along has lots of benefits. Aside from the Easter cheer that it brings, you get to help too! How? So pass this one on, pretty please? I am tagging all my beautiful marces from the Marce Club namely Chris Fedhz Gene Jade Kaye Liz Mye Niko Pehpot Seiko Yami. Thank you Kikamz for posting the tag. A nice day to you! Happy weekend Marce & God Bless!Hugs!